As the daily routine of work evaporated, being able to spend a period of time in a useful activity is part of enjoying retirement. Recognizing that the Y really needs volunteers to help keep it working in a healthy and fun manner is a reason to participate. I enjoy chatting to lots of folks about any number of topics of conversation from where a good holiday might be to ideas about getting that sore knee back in shape. It’s good to be able to provide tips to others on how to improve a running style or maybe a swimming stroke. This is nice as it covers all age groups that visit the Y to get their daily or regular shot of exercise. Lastly the staff and other volunteers generally all have the same outlook on life, so it’s fun interacting and helping with whatever needs doing. 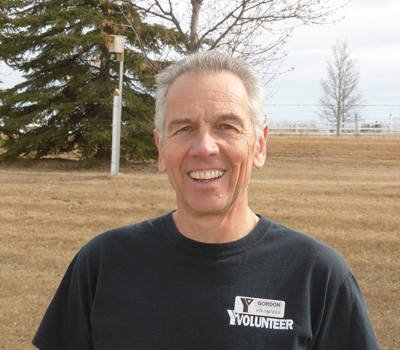 My wife Barb and I have trained out of the Y for many years as part of our regime for running and triathlon races. We joined Shawnessy only a few weeks after it opened due to it being close to home. With that we found that we were using the facility more and more and when we retired – a whole bunch more! Volunteering just seemed the next thing to do.